I’ve mostly written about Helsinki in my blog but since I also follow many interesting planning projects and discussions elsewhere in Finland, I want to expand my geographical scope now and then to share thoughts and insights from different corners of this urbanizing country. May this be the first one of many more. Beyond the beautiful streets of Helsinki, I’m especially actively curious about what’s going on in Finland’s second largest urban center, Tampere. Tampere is located on an isthmus between lakes Näsijärvi and Pyhäjärvi, a bit less than 200km north from Helsinki. The city often gets dubbed as Finland’s Manchester because of its industrial heritage. Map by Google Maps. This is, firstly, because Tampere happens to be the city I grew up in. But there’s more to this relationship. My interest in Tampere – and even cities more broadly – perhaps runs in my veins because I have an interesting family history connected to different aspects of Tampere’s development. My great-grandfather Mauri Pesonen worked as a plan drawer under Tampere’s City Architect Bertel Strömmer roughly during the first half of the 20th century. Hence, he directly worked within the field of urban planning in Tampere. Furthermore, my great-grandpa was one of the founders and masterminds behind the establishment of Tampere-Seura (Tampere Society) in 1938. This was to create a framework for a diverse interest group of individuals from different fields of society brought together by a passion to promote local patriotism – to “make Tampere increasingly significant and prominent among other cities”. My great-grandfather Mauri Pesonen helped to build this 12.2 sqm scale model displaying Tampere in 1890. It took four years to assemble it and the work was finished in 1959. It’s now located in Vapriikki. With the next generation, Mauri’s son and my grandfather Professor Pertti Pesonen vigorously engaged into discussions over Tampere’s development, too. He didn’t work with urban planning or policy directly, but as the editor-in-chief of the city’s main newspaper Aamulehti between 1979 and 1990, he did invest a lot of time and energy dealing with contemporary city-related issues and communicating them to the public. Following this storyline, I sort of feel inclined to expand my blogging to cover Tampere. Even if I’m light years away from any authority Mauri or Pertti had in their time. But secondly and more substantially, I’m interested in Tampere because the city has recently decided to or is planning to invest heavily into large-scale urban interventions. Very much like the growing series of attempts across cities elsewhere in Europe and North America to boost local livability by trading single-use traffic zones with softer urban qualities such as mixed-use neighborhoods and parks. 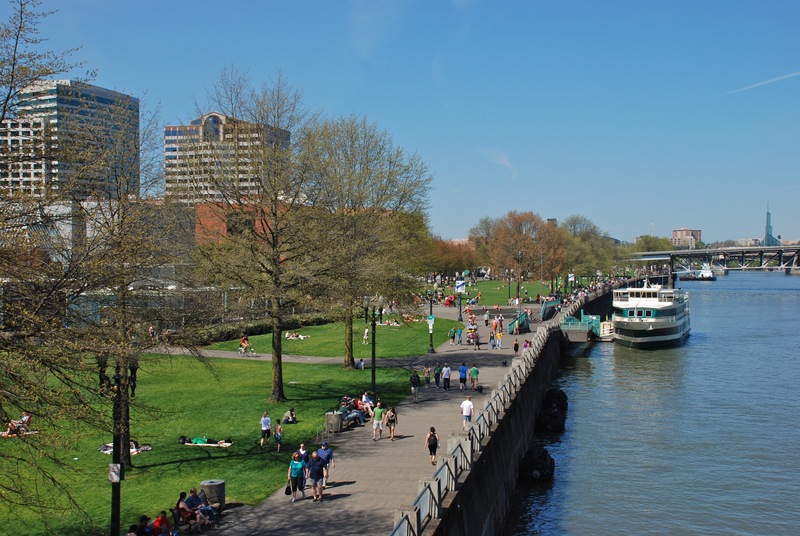 Portland, Oregon, has been a pioneer in this practice with its 1978 intervention to replace Harbor Drive, an urban highway running between the city center and Willamette River, by an urban waterfront park. In more recent examples, Madrid dug a section of a major urban highway underground in 2011 to open Rio Madrid, a 10-km long linear riverside park. Similarly, Amsterdam is investing heavily into an urban mega project in Zuidas, where the city’s ring road is planned to get buried underground to make room for Amsterdam’s expanding financial district. Tom McCall Waterfront Park, in Portland, Oregon, viewed from the Hawthorne Bridge. Photo by Steve Morgan/Wikimedia Commons. Such projects often have their roots in changed attitudes on urban livability issues. Dense, connected, vibrant, and people-friendly are among important qualities now in better currency than ever during the past decades. These goals for achieving livable cities have entered planning and policy discourses apace with the 21st-century global “urban renaissance” phenomenon that has evolved from the needs of the post-industrial economy, global warming awareness, and demographic trends that are increasingly bringing generations with urban living aspirations and needs to the housing market. 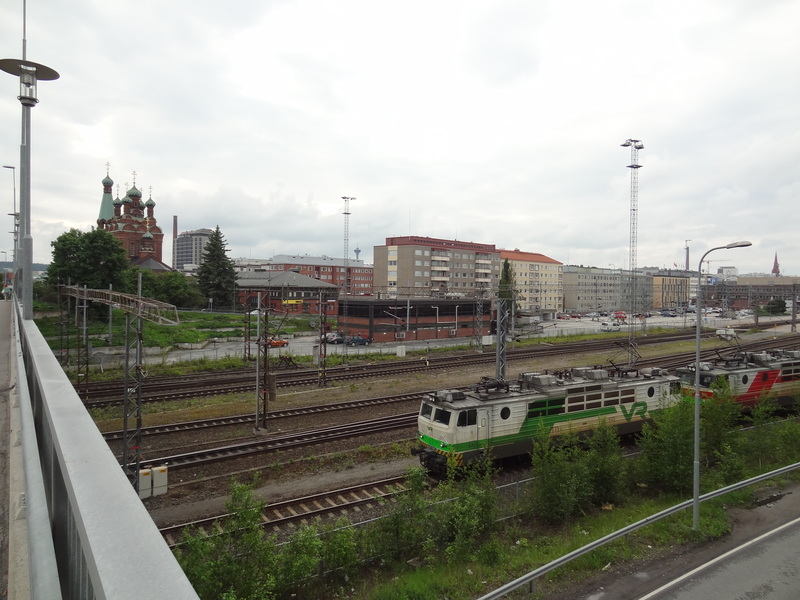 One of Tampere’s mega projects is to cover up railway tracks around the city’s train station to fill the void in the city’s urban fabric caused by the station area and to promote continuous urbanity in the core of the city. 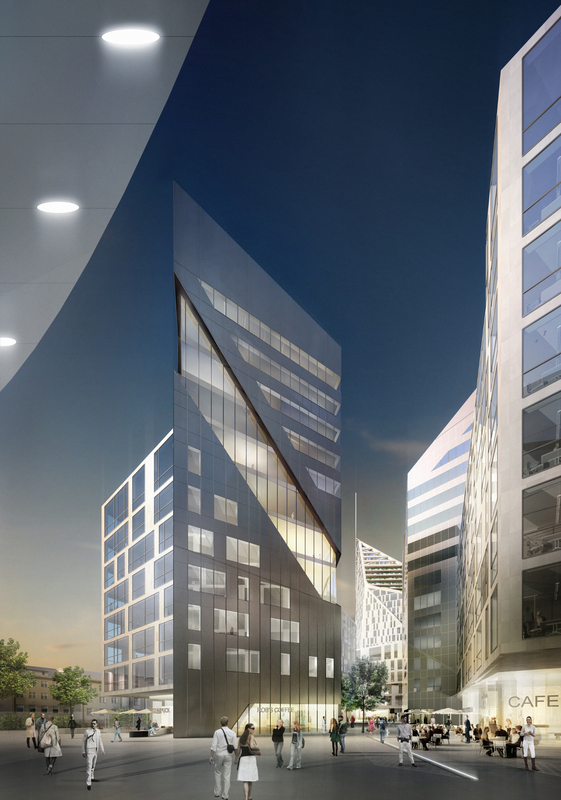 This strategic move began with a 2011-approved initiative to build a large new multipurpose arena and high-rise office & residential towers on a large deck structure just south of the station, and continued this year as the city launched an idea competition to expand the redevelopment project to the rest of the railway station area and its immediate surroundings. The railway cuts the eastern side of Tampere’s inner city into two. This photo displays tracks just to the south of the railway station. Some of the plans to cover the tracks. This is the same site as the picture above. Photo courtesy of tampereenkeskusareena.fi. Elsewhere, Tampere has started to go ahead with tunneling the most central section (2.3km) of its only high-velocity downtown thoroughfare, Paasikiven-Kekkosentie/highway no. 12. Since the 1970s, the road has on the one hand provided access to central Tampere from the suburbs as well as a corridor to pass the city efficiently. But on the other hand, the four-lane highway has also very efficiently blocked citizens’ access to Lake Näsijärvi on the northern shore of the city. With the tunnel, the retrofit project is set to conserve the road’s functions while at the same time it’ll allow people to reclaim the lakeside areas and the development of new centrally located urban neighborhoods for about 6 000 residents on the freed lands. This lake shore will be freed for people. Photo source: Tampere.fi. The aims of these interventions to reconnect poorly accessible parts of the city and to open new areas for creating walkable mixed-use development are obviously music to the ears of urbanists like myself. But with respect to the goal of increasing the city’s livability in the long-term, an interesting question is whether Tampere – instead of opting for the tunnel & deck solution for its highway retrofit – should have chosen to do what Helsinki is planning to do with most of its land-consuming urban highways: transform them into Parisian-style boulevards by thinning them down to about half of their width. This boulevardization scheme would mean the same capacity to carry vehicles but with lower speeds. An equation which leads to less traffic noise, better controlled emissions, a lot of freed land beside the road for new development, and increased adjacent real estate values. A highway retrofitted into an urban boulevard. Picture courtesy of Carlos Lamuela. These two alternatives were in fact fiercely debated during the tunnel’s decision-making process, with the no-tunnel parties chiefly arguing that the cost of the tunnel is too much (€180m). I’m not going into that discussion since the decisions have been made and the project is already underway. 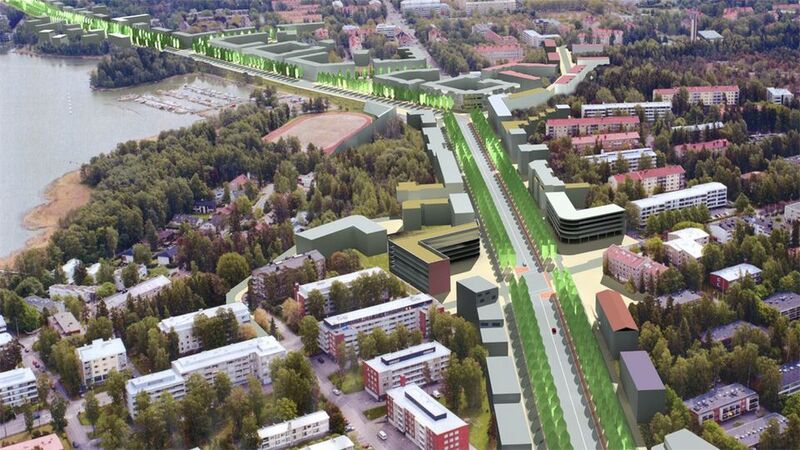 Tampere is getting rid of the surface highway with a tunnel. But I want to discuss a broader issue Tampere should in my opinion carefully address in the future: will the city ultimately choose a planning culture that favors cars or a people-centric planning culture focusing on promoting human-scale interventions? The question is timely because right now it’s impossible to say which pathway the city is primarily pursuing. As opposed to building highways, parking lots, ramps, shopping malls, gas stations, and other structures to accommodate cars, the people-centric approach to planning is grounded on the idea to take space away from cars and invest into qualities such as short distances, walkable urban fabric, and high-quality public spaces. In other words, cutting the need for driving. Tampere’s tunnel & deck highway redevelopment pattern is a perfect example of the current situation where the city constantly seems to be planning with feet in both camps: accommodating space for cars with the tunnel as well as space for people on the surface. Another good example is Tampere’s strategy for keeping the city center a vibrant and inviting destination. 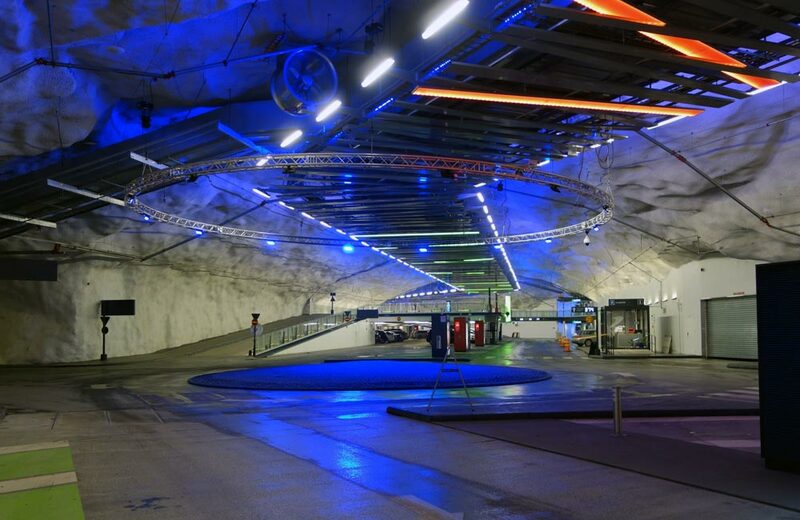 As a key intervention, the city recently opened a huge underground parking facility (P-Hämppi, capacity approx. 1000 cars) below the eastern half of the city’s main street, Hämeenkatu. The cost of that project was €74m. And now the city is planning to do the same beneath Hämeenkatu’s other half (Kunkun Parkki). But this time around with almost double the parking capacity and costs. P-Hämppi. The parking facility is so big they needed to put a roundabout inside it. Photo source: Tampere.fi. The main arguments for burying the cars underground – exactly like in the tunnel project – is to liberate more space for people at the street-level. The thought is certainly pretty, but the core problem with such double-dealing planning is that even if the cars are out of sight in some locations, they’re still very much there. A single project like this may be justified due to the unique geography of the city (as with the tunnel project), but in the long run choices will need to be made. If you just hide cars like in the center and simultaneously make it convenient to park there, you’re not reducing cars but in the worst-case scenario actually getting more of them. This is because at all the other segments of the trip to the center sans the part where cars are neatly tugged underground, they’re not neatly tugged underground. On the contrary, they occupy city space on arteries, neighborhood streets, and around service outlets, constantly demanding to be accommodated with the same convenience as in the center. More lanes, roads, bypass roads, tunnels, and parking facilities are needed before you know it. And those don’t come cheap. Plus you still need to find space and resources for those people-friendly projects. “If you plan cities for cars and traffic, you get cars and traffic.” And also gas stations, shopping malls, long distances, and so forth. This is ABC Teivo, a gas station/shopping center hybrid that opened last year. Photo source: Ylojarvi.fi. Furthermore, since it is obvious that people will keep on migrating into Finland’s main urban centers (Tampere region is projected to grow by about 100 000 people in the next 25 years or so) and that increasingly many want to live in urban neighborhoods instead of suburban detached homes, Tampere is facing the same problem Helsinki is trying to deal with: there is an enormous lack of supply in possibilities to live in urban neighborhoods compared to the demand. The truly lively and walkable part of Tampere is only limited to a 3 by 2 km zone in the very center whereas in much of the rest you’re best off with owning a car. So if the city wants to stay competitive in the race for attracting innovators and creative minds, many more sprawl repair and infill projects need to get going. Under these 21st-century circumstances, one might transfer Fred Kent’s insight to the realm of wider urban policy by adding: if you only plan for cars, you’re in trouble – and if you plan for cars AND people, you’re bankrupt. This brings me to the last major project Tampere has on its planning agenda: the introduction of a tram system. The general layout of Tampere’s tram system. Sources: The City of Tampere/IDIS Design Oy. 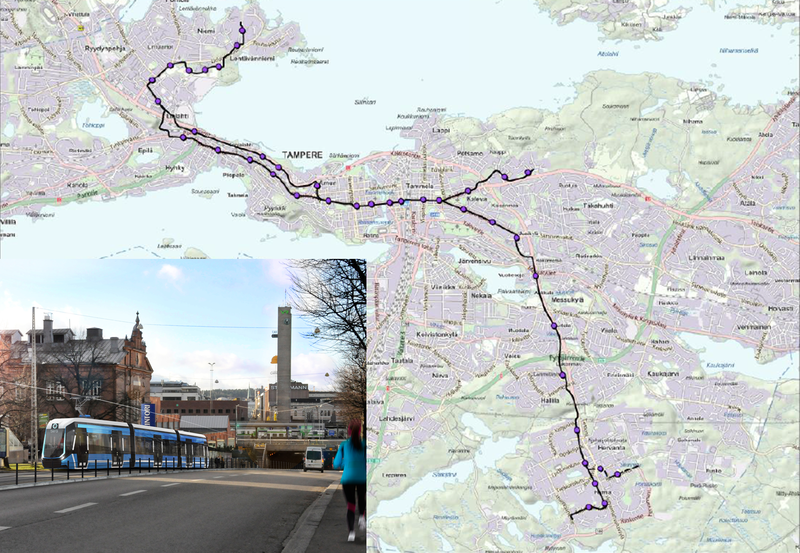 For some years now, Tampere has planned to build a tram (or light rail) line that would generally run across the city from the south-eastern suburbs (Hervanta) to the north-western ones (Lentävänniemi) with an additional service to the university hospital area. 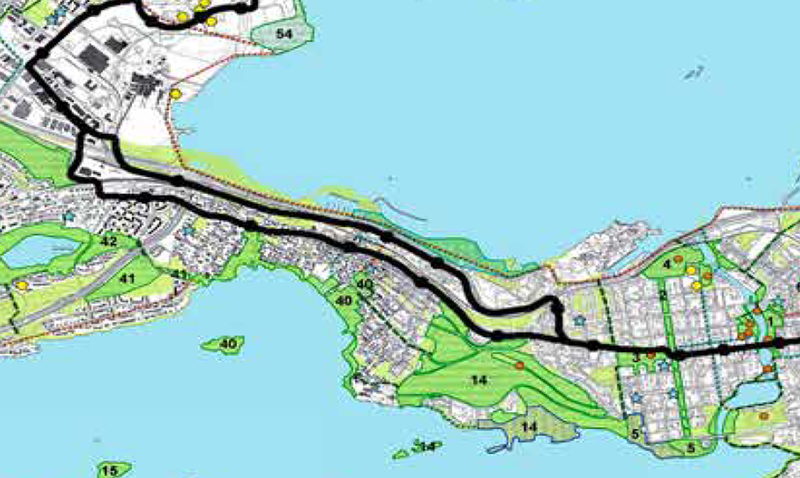 These proposed 23.5km of tracks would place a little less than half of the city’s residents within its service area. But more importantly and according to the official proposal, the plan has the potential of adding 35 000 more with new neighborhoods and infill development. In my books, this project is the perfect opportunity to lay the foundations for a people-friendly city. The official development potential estimates are naturally careful and based on business-as-usual low-density planning. With a more urban-minded zoning approach there certainly is space for many more. Furthermore, the best thing about rail transit is that it always is a long term investment in terms of urban policy-making. The tracks aren’t easily going anywhere once laid down. Perfect news for real estate investors. So why hasn’t Tampere already gone forward with the tram? Well, the main issue seems to be money. Surprise, surprise. Opponents argue that buses would essentially do the same job as the tram for less than the tram system’s €250m price tag. Proponents argue that the tram would pay itself back over time in the form of more residents and businesses – being the physical land-use promise and strategy for the future as it is. Another key issue that decision-makers haven’t been able to agree on is the tram’s western route along the isthmus Tampere is built on (see picture below). 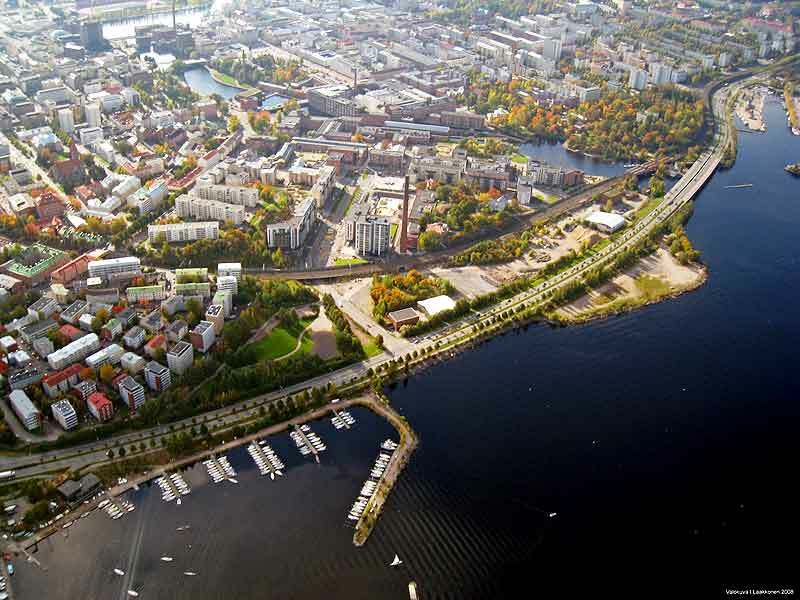 The isthmus is actually the world’s tallest esker/ridge (162m above sea level and 85m above lake level) which basically means that Tampere to the west of the city’s center is characterized by a long, tall and narrow hill between the inner city and the more distant suburbs. Besides its nature-related features, the esker is best known for Pyynikki and Pispala, two traditional working-class neighborhoods characterized by small-scale wooden houses on the esker’s slopes and a bohemian community of artists and other creatives. This is especially the case in Pispala. Again, this route quarrel is a symptom of the same ideological paradox of not being able to choose whether to either accommodate cars or people in the city’s planning. One option for the tram is to run through Pyynikki and Pispala on its way to the western suburbs while the other option is to divert it on a route down by the lake and along the same urban highway a section of is now being tunneled. The latter option has been hailed for being quicker and promising more new development potential. The two route options on the isthmus. The northern one is the highway route and the southern one the Pispala route. Map source: The City of Tampere. Obviously, the tram is bound to be faster along the narrow highway stretch as trams could run on their own isolated tracks and, well, no one lives there. Another argument raised against the Pispala route is that trams are bound to get stuck in traffic up there as there is no space for isolated tracks. Yes, I’m confident they will. But only as long as cutting traffic along the route is not an option. I wonder if anyone has seriously thought of pursuing an approach to direct most of the car traffic to the highway by the lake – which certainly isn’t going anywhere with the 180m € tunnel investment and all – and to focus on people-centric planning initiatives along the Pispala thoroughfare? The quicker route may seem as a cost-effective solution, but it is also worth considering that the area along the Pispala route is an already existing cultural hotspot, a destination people want to go to throughout the year, has a lot of infill potential for small-scale urban solutions, and it would ultimately promote the idea of connected, continuous urbanity in the city. And just plain practically, there is a railroad that significantly blocks access between the neighborhoods and the lake shore. I’m not sure if any of the qualities I listed can ever be attached to the proposed neighborhoods next to the highway in the quicker route option. That might at least presuppose another tunnel. Pispala throughfare could be put on a road diet to take space away from cars. Also promoting small-scale infill projects everywhere and adding shopfronts would add appeal to the area. Urban landscapes around the tram’s potential highway route. Enchanting. Photo by Google Street View. We’ll actually find out very soon if Tampere will get its tram, and if so, which route alternative gets chosen. Tampere’s City Council will sit down on June 16 to vote on it. My message for Tampere’s decision-makers is that combining the costs for these enormous projects I’ve discussed, brings us to a balance of about €400m budgeted for infrastructure projects promoting a culture of automobility. And on top that, €250m plus whatever the cost of the deck structures around the railway station for the promotion of the people-centric ones. These sums of course are not all public costs, but my point is that whether public or private, there’s only a limited amount of cash to go around. With that being said, what wonders could these about €1 billion have done for the city if Tampere had chosen to channel its public funds and persuade private investment flows into people-centric planning projects from the get-go? I suppose the tram system could be operating with multiple lines by now. But in any case, I’m sure that such grand-scale investments into people-centric projects in the 21st century would definitely have Tampere on a path to become “increasingly significant and prominent among other cities”. Probably on the European scale, too. My great-gramps Mauri would be proud. Tramway is assumed to save operating cost by 6 millions per year and to increase ticket sales by another 6 millions per year. Numbers are from the latest plan. So we can arcument that the tramway is paying itselfs back even if we omit indirect benefits. And opponents now simpy denie the calculations. 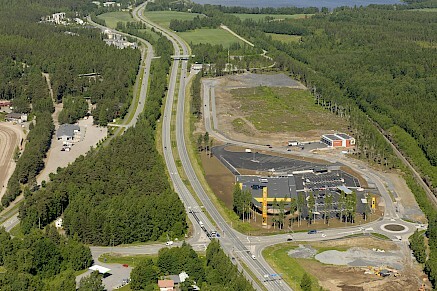 The idea to reducing the traffic at Pispalan valtatie have been part of the plans very long. Or better saying reducing the traffic has always been part of the Pispalan valtatie alternative. It was also one argument for the tunnel: tunnel would make possible to remove traffic from Pispala to the Paasikiventie and hence make the tramway possible through Pispala. But now it seems that decision makers are not ready to cut car traffic in Pispala. And govermental traffic engineers thinks that car traffic keeps on increasing and therefore we will need both new Rantaväylä and Pispalan valtatie for cars. And perhaps they are right if we will make so much new parking space at the city centre.